Paleontologists have painted a grim picture of the short and brutal life endured by a Daspletosaurus, a member of the tyrannosaur family. Damage inflicted to this specimen's skull affirms the suggestion that that these fearsome carnivores engaged in inter-species combat — and even cannibalism. The idea that tyrannosaurs were cannibals isn't anything new. Like any giant carnivore, these theropods participated in opportunistic feeding, eating whatever was available — alive or dead. But they were more than just scavengers; recent evidence shows tyrannosaurs were predators who sometimes hunted in packs. They featured a diverse diet, feeding off fish, mammals, lizards, pterosaurs, birds, and other non-avian dinosaurs. Theropods also hunted other carnivores for food, though rarely. What's more, much of the fossilized evidence suggests that tyrannosaur-on-tyrannosaur action was not a function of predation but rather something else, such as ritualized fighting linked to mating. As to the exact reasons for interspecies combat, paleontologists aren't entirely certain. This makes this latest fossil discovery all the more fascinating. The skull of this Daspletosaurus — a Cretaceous-era tyrannosaur slightly smaller than T. rex — exhibits signs of both interspecies combat and opportunistic feeding in the form of cannibalism. A fossil analysis by paleontologist David Hone from Queen Mary University of London, with the help of Darren Tanke, shows that this particular individual survived a brutal encounter with another Daspletosaurus. It managed to survive long enough for the resulting head injury to heal, but then died sometime later of unknown causes. Lying dead on the ground, its decaying remains were consumed by another tyrannosaur. This particular Daspletosaurus endured a tough life. It wasn't fully grown at the time of its death and was like an older teenager in human terms. It measured 20 feet (6 meters long) and weighed around 1,100 pounds (500 kg) when it died. During its encounter with the rival Daspletosaurus, it received a terrible injury; a bite to the back of the head broke off part of its skull and left a circular tooth-shaped puncture through the bone. Hone's analysis shows that the surface of the skull exhibited signs of healing, meaning that this injury wasn't fatal. The skull featured a number of other injuries, though not all of them could be attributed to bites. "This animal clearly had a tough life suffering numerous injuries across the head including some that must have been quite nasty," noted Hone in a press release. "The most likely candidate to have done this is another member of the same species, suggesting some serious fights between these animals during their lives." The paleontologists aren't sure how this individual died, but there's no evidence to suggest it was killed by another Daspletosaurus. But by analyzing the skull and other bones, it appears that after the individual began to decay, a large tyrannosaur — possibly of the same species — chewed into the animal and ate at least part of it. According to Mark Norell, Chair and Curator-in-Charge of the American Museum of Natural History's Paleontology Division and a paleontologist unaffiliated with the study, it's more confirmation as to what we already knew. "It doesn't surprise me very much — but it is great evidence for it," he told io9. "Everyone will agree that, like all giant carnivores today, the carnivores of the past were opportunistic feeders." For comparison, Norell points to lions, crocodiles, komodo dragons, and other large extant carnivores. "Many of these large carnivores would kill animals," he says, "but if they found dead stuff on laying on the ground they're going to eat that, also." As for the issue of interspecies combat, Norell says its still impossible to draw any conclusions about Daspletosaurus. "They're probably fighting over territory, mates, or a kill, but we certainly don't know," he told io9. Read the entire study at PeerJ: “Pre- and postmortem tyrannosaurid bite marks on the remains of Daspletosaurus (Tyrannosaurinae: Theropoda) from Dinosaur Provincial Park, Alberta, Canada”. 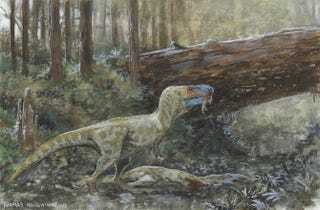 Illustration of combat between two Daspletosaurus by Luis Rey.